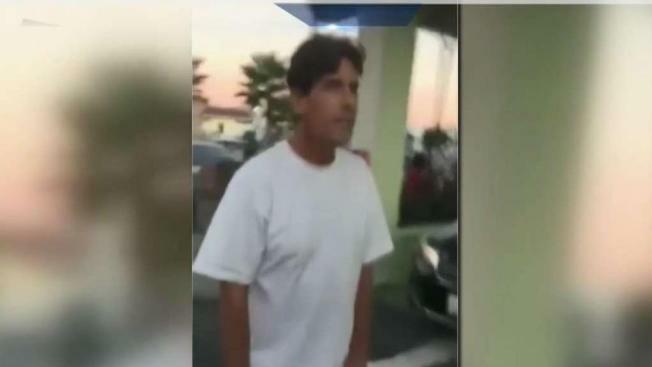 Westminster police said they were looking for a man who allegedly assaulted a 39-year-old special needs man outside an In-n-Out in Westminster last month. The victim's mother didn't want to reveal hers or her son's face, saying they're hoping to move passed the incident, but applauded Westminster police for its attempt to get the video out over social media. "A man came out to our right and he was upset at the people at In-n-Out because they weren't speaking loud enough and he didn't hear his drink order," the victim's mother said. She said they were waiting for their own order, and when the number was called, they didn't hear it right away either. "Apparently we were slow to respond and then our son walked up to get the food and he started screaming at our son," she said. "And he just screamed you f---ing slow retard. And I was stunned." Her son is autistic and is considered special needs. But he's also an athlete, and a volunteer with his local police department, which is why he intuitively knew what to do. "We were concerned about what our son's reaction would be. He put his hand out to stop the man. But he didn't hit him," she said. Before the man could take off, she says her son started rolling video on his phone. "He watches all the shows," she said. "He knew you're supposed to do that for the police." The video doesn't show the alleged assault. His mom says the man punched him in the face twice. In the video, the man can be heard calling the victim a "retard." Westminster police to know who the man in the video is and put a message on Facebook, saying: If you're the suspect and watching this, come and turn yourself in, otherwise, we'll find you.